An engine that runs too hot does not last long. While your engine’s cooling system is responsible for regulating operating temperature, your exhaust system also plays a major role. Much of the heat energy of the combustion process is unusable and must be disposed of quickly. That is the job of all the piping and ducting that runs from the motor to the back bumper. Hot air and vapors are cleaned, cooled, and passed safely out of the rear pipe. Old worn out pipes with leaks and restrictions need to be replaced. We specialize in muffler repairs and can install custom exhaust systems that will hwlp keep your engine running at its best. Contact our Meineke #2230 in Crystal Lake, IL, for an evaluation. Exhaust systems experience a lot of wear and can develop leaks and cracks. Keeping track of the state of your muffler is important to your car's function and your safety. If you want your car to run smoothly and protect you from carbon monoxide poisoning, check on your car muffler. If your average miles per gallon are going down, the car is sounding louder, or a bad odor is coming from the car, you should stop by a muffler shop to get it repaired or have it replaced with a performance exhaust system. We'll perform all inspections, maintenance, and replacements needed at Meineke #2230 in Crystal Lake, IL. Performance exhaust system leaks can lead to far-reaching problems. You may think your car’s custom exhaust systems are designed just for muffling engine noise, but performance exhaust systems are also responsible for decreasing the amount of pollution that your car releases into the atmosphere. Properly functioning exhaust systems sound better and are safer for the environment. If your high-performance exhaust system fails, it can affect your fuel mileage as well as air quality. Aftermarket exhaust or stock exhaust systems are complex, but our emissions experts at Meineke #2230 in Crystal Lake, IL, can perform muffler repairs and get you driving safely again. Contact us today! Are you thinking of investing in a performance exhaust system, but you want to have more information first? There are several benefits to getting aftermarket exhaust installed on your car, including a more powerful engine. Performance exhaust systems for cars allow exhaust gases to flow more quickly and easily. Your engine can breathe more and perform better with the help of high performance exhaust. Another thing that many drivers enjoy about custom exhaust systems is the louder and more aggressive sound produced. 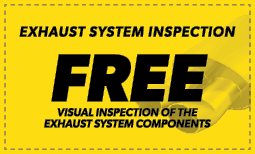 If you want to learn more about installing a new exhaust system on your car, contact Meineke #2230 in Crystal Lake, IL. Unless you are a trained mechanic, you may miss warning signs of serious problems with your vehicle. Save money the smart way by stopping by our online exhaust repair coupon site. Not only will your inspection and repairs be made by a professional mechanic at Meineke #2230 in Crystal Lake, IL, you may save yourself valuable time and money in preventing future issues with your muffler or exhaust system.